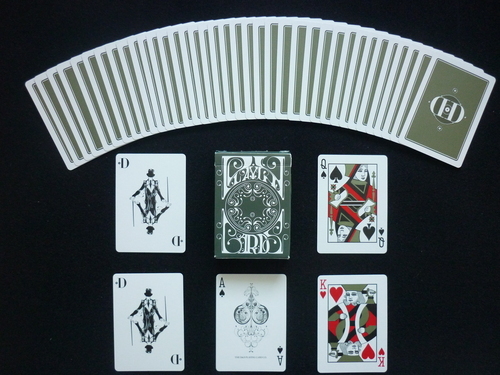 In contrast to the previous versions, the Smoke & Mirror V4 was only one deck. Also called the Green edition, it is an eco friendly deck printed on Aristocrat stock. The box states they were "Made from recycled paper". To accentuate the theme the back design is more simplistic, and it features green metallic ink on the backs and on the court cards. Dan and Dave were disappointed with the production of the V4 due to issues with the metallic ink. Two different print runs were done, one has a green seal on the box and the other has no seal. Comes with the Smoke & Mirror Jokers and Ace of Spades, as well as a double backed gaff card.